Let me start with how I got the dresser in the first place. I was out driving and saw it on the side of the road. I pulled over, backed up, put on my cap and slid cautiously out of the car. Yes I find it embarrassing. And even more embarrassing if the owner was to see me! I'd probably leave it and run. I knew it had potential and it was coming home with me. Don't mind the thing is solid wood and needs two people to carry it. I picked it up and hobbled to the back of my car. and no they were not in them, lucky for them, haha. I laid down the back seat and then removed our rather large pram from the boot. All the while keeping a hawk eye on my prize. So 15 minutes later I was lifting and heaving and pushing the dresser in the back of the car. Thank goodness I remembered to put the pram back in before driving off. Our pram was not cheap and would not have been a fair trade! I then slinked back around to the driver seat and drove off. lengths I went to to get it in the car. why not recycle it into something I can use. 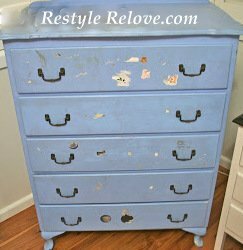 I love the shape, all the drawers are clean inside and in perfect working order. And it will be a great storage dresser. but I recently saw some dressers done as craft storage and they looked amazing. I hope mine turns out amazing too. I'll keep you posted! I LOVE FREE.Good find I can't wait to see what you do. great find and i love the story! I usual wait until the cover of night so I'm right there with you. You couldn't leave a prize like that on the side of the road. One thing I have learned is to stop the first time you see it because when you go back it will be gone. I've even got my husband scoping things out for me. It's true love!